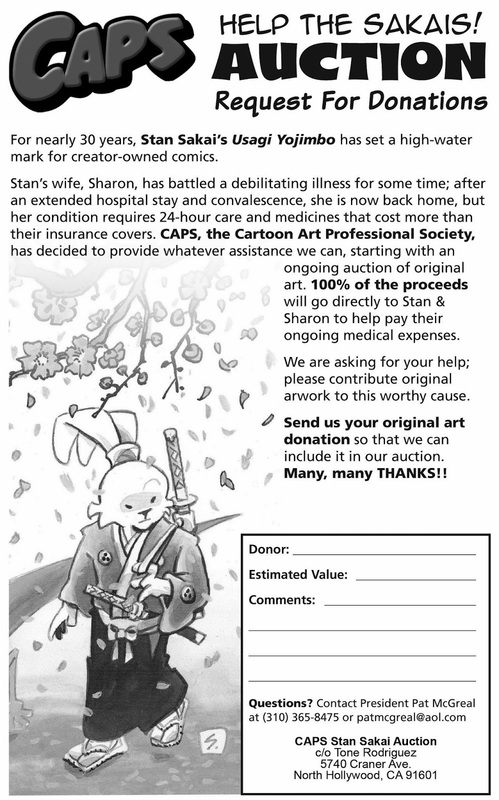 The Comic Art Professional Society is organizing a fundraiser to help acclaimed Usagi Yojimbo creator Stan Sakai with his wife Sharon's medical expenses. According to the organization, Sharon has suffered from a debilitating illness that required an extended hospital stay and convalescence. She's now back home, but requires 24-hour care and medications that exceed their insurance coverage. To help, CAPS Vice President Tone Rodriguez is spearheading an art auction, with all proceeds going to benefit the Sakais. Creators and publishers who wish to contribute original art are encouraged to print out this form to mail with the work to Rodriguez. This with questions are encouraged to contact CAPS President Pat McGreal, whose email address and phone number appear on the form. Anyone who wishes to donate money, can do so through PayPal.